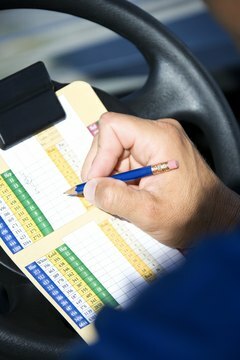 The scorecard is a critical component for every golf course and golfer. After completing each hole, a golfer records his score on a scorecard. Each player is responsible for keeping his own score and being truthful when writing down his number of shots. The scorecard also serves as a guide for the golfer when playing the course, showing most difficult holes and the yardages for each hole. A golf scorecard is printed on card stock folded in the middle, so when it is opened the golfer sees on the inside of the card information about all 18 holes, each nine on a side. Scorecards vary in size and layout, but a standard size is 12 inches long and 4 1/2 inches high, or 6 inches by 4 1/2 inches when folded. Golf courses may have as many as five yardage options--or sets of tees. On the scorecard the yardage for each set of tees is shown in rows. Each set of tees is usually given a name such as “gold tees” or “red tees.” In the middle of the scorecard are rows for each player to mark down his score, each hole shown in a separate column. On the left side of each row is a wider box for the player’s name and boxes to total the score for each nine holes and for the total 18-hole score. Par is the target score for each hole, the number a good player expects to achieve. On a par-4, a player would try to reach the green in two strokes and either sink the putt and make a birdie 3 or take two putts and earn a score of par. Holes may be par-3, 4 or 5. Each hole is rated by difficulty, one being the hardest on the course, and 18 the easiest. These numbers are listed in a row titled “handicap.” This allows a player to compute a net score for each hole based on his handicap, which measures a golfer’s skill based on his previous scores. Someone with a 12 handicap would deduct one stroke from his gross score--the actual number of shots he took--on each of the 12 most difficult holes to compute his net score. The handicap system lets good players, average players, and even poor players compete with one another on the more equal basis of net score rather than gross. Each set of tees is given its own rating, which is a measure of the course’s difficulty from each set. The course rating is designed to indicate what a scratch golfer--one who is capable of shooting around par--would score on an average day. Course rating can be higher or lower than par depending on the yardage and the hazards. A course rating of 73.8 from the back or longest tees indicates the course is challenging. Scorecards may have other useful information, such as a course diagram, the name of the architect who designed the course, winners of prestigious tournaments at the course, the name of the course's head professional, or special local rules that may apply such as white stakes designating out-of-bounds areas.